It is an honor to me! Thank you so much!!!! I really love Stitch and this is so amazing! Awesome work! Stitch is one of my FAVES!! 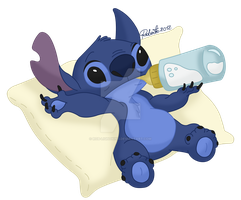 I love stitch, he's just so darn cute!!! The stitch is one of my favorite disney characters!!! he's just so darn cuddly!!!! This is very cute seeing Stitch wearing the sorcerer's hat. Aww. I love the color in this. Great picture! Stith looks great!! !